There are two approaches to managing a body of knowledge within a community of practice - curation, and synthesis. One of the functions of a community of practice is to provide a means for developing and co-owning a "body of knowledge" on behalf of the community (the other function is to provide a means for dialogue and discussion, particularly question-led discussion). Members of the community can offer pieces of knowledge, and the community as a whole (or the Subject Matter Experts within the community) builds this into a collected set of community knowledge. There are two ways to do this - through curation and through synthesis, and many of the most effective communities do both. 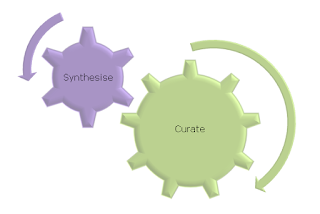 Curation is the organisation of a set of artifacts or assets on behalf of the users. A Librarian curates a collection of books in a library, a museum archivist curates a collection of fossils, or paintings, or historical objects. Similarly a community can curate a set of documents. We can see an example of curation with the NASA spaceport "body of knowledge" - a curation set of documents on spaceport operations. Validated by an expert or a community of practice. We can see an example of Synthesis - a page from the Aviation Skybrary wiki which contains a synthesis of knowledge, followed by a list of source documents. Wikis are often the preferred technology to support knowledge synthesis. The benefit of synthesising knowledge is to make the knowledge far easier to consume and assimilate by the reader/user. Instead of having to wade through a curated list of source documents, resolving contradictions and removing duplications as they go, the work has already been done for the my the CoP or by SMEs within the community. There is an investment of work in creating the synthesis, but it saves every user from having to redo the synthesis themselves. Once the synthesised knowledge exists, then updating is is fairly simple. New knowledge, new CoP discussions, new lessons can all be added to the synthesised knowledge, for example as wiki edits. Many communities of practice combine synthesis and curation, with a wiki (containing synthesised knowledge) supported by a community library.